Greece is to sell five-year bonds in the country's first long-term debt sale since its international bailout started four years ago. 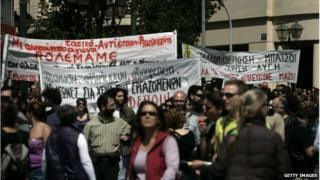 The news came as thousands of striking Greeks marched on parliament to protest against job and spending cuts. "The Hellenic Republic announces today it has mandated international banks for an imminent five-year benchmark bond issue," the finance ministry said. The bond would be priced in "the immediate future", it said. More than 20,000 people marched peacefully through the streets of Athens chanting: "EU, IMF take the bailout and get out of here!" The 24-hour strike left schools and pharmacies shut, ships docked at ports and hospitals operating with only emergency staff. German Chancellor Angela Merkel is due to meet Greek Prime Minister Antonis Samaras in Athens on Friday. Germany has insisted on spending cuts and tax increases in return for loans. Turnout at the march, which lasted two hours, was similar to protests held during the last nationwide strike in November, according to the Reuters news agency. In April 2010, Greece could no longer fund itself and received two bailouts, including loans of 240bn euros (£200bn; $330bn). The country's economic output has shrunk by a quarter and unemployment remains close to 28%. There are fewer Greeks employed than at any time in the past 33 years. In recent weeks, the Greek parliament agreed further austerity measures - including the sacking of 11,000 public sector workers - in exchange for the latest instalment of bailout money. Greece may be returning to the market as the cost of borrowing is falling. Last month, Greek lender Piraeus Bank sold its first bond in more than four years. The bond offered investors a yield of 5.125% and now trades with a yield of about 4.125%. On Tuesday, Greece's short-term borrowing costs were lower than a month ago, with interest rates on a six-month treasury bill sale falling to 3% from 3.6%.